A religion which is rich in this sense always has a number of ideas in reserve. Besides the ideas that are being applied to a particular problem or a particular period, there are a number of rich fields of thought which are, in that sense, lying fallow. Where a new theory, invented to meet a new problem, rapidly perishes with that problem, the old things are always waiting for other problems when they shall, in their turn, become new. A new Catholic movement is generally a movement to emphasize some Catholic idea that was only neglected in the sense that it was not till then specially needed; but when it is needed, nothing else can meet the need. In other words, the only way really to meet all the human needs of the future is to pass into the possession of all the Catholic thoughts of the past; and the only way to do that is really to become a Catholic. In a recent conversation with a friend that is entering the Church this Easter, he mentioned that he could never had imagined the depths to the Catholic faith, and the terrific deposit of thought and knowledge upon which our practices and teachings are based. The above passage from Chesterton beautifully expresses this part of Catholicism that is often completely missed or ignored. One amazing example of Chesterton’s point about some new movement only drawing upon the fallow fields of thought is St. Pope John Paul II’s Theology of the Body. This was a new work of composition, but the original homilies were themselves meticulously referenced and drawn from very old teachings and ideas of the faith. This Theology of the Body rose in popularity and continues to rise, providing the response and answer to the sexual revolution, collapse of the family, and our culture’s rejection of the personhood of the unborn. I have come across dozens of Catholic books that have fallen by the wayside – books that despite their value have all but disappeared from shelves. In some cases, the only know copies of the texts were in seminary libraries. 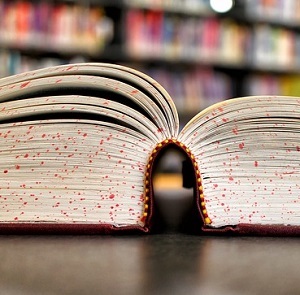 In their forgotten state, many have passed into the public domain through failure by their publishers to renew the books. They may not be written by canonized saints, or Chruch Doctors or Fathers, but they do represent good works of holy thought. Not having them available in today’s print-on-demand and electronic media distribution systems leaves a potential hole in our tapestries of Catholic media, especially the late 19th and early to mid 20th Century. I have reproduced some books already, with Belloc’s Characters of the Reformation and Joan of Arc, Fr. McNabb’s Old Principles and the New Order, and The Life and Letters of Father Damien. I will be continuing to add more books as a project I have come to refer to as “Fields of Thought” after Chesterton’s term for the collection of Catholic ideas and expression that grow and multiply, rising when needed to answer the ills of the world. As new books are added, I will provide links here to the new editions. I already have several works in progress, and should have an announcement or two in the coming months. Even years after I wrote The Way of the Christian Samurai, I still get comments and questions as to why I wrote the book. I don’t have a background in the martial arts, though I would appreciate a good sensei. My interest and inspiration into the concept of Christian lessons from samurai writings started with my own recognition that I was a terrible salesperson, especially for my own work and skills. At my local library I found an intriguing-looking book called Samurai Selling. The idea behind this book was that the servant warriors of japan, the samurai, could teach the modern salesperson a great deal about what it means to serve. The quotes from Musashi and the Hagakure captured my imagination. No one talks like that anymore. You could say that about any historical text, I suppose, but for me the ancient samurai texts rang particularly true, and I sought to read the source material. While I suppose their was some inkling that modern Christians could get schooled in how to serve others and their Lord by these pagan soldiers for hire, the idea of matching up the writings and Christianity did not start to consume me until another unusual work. Ghost Dog: Way of the Samurai. I have no idea why I chose to watch this movie initially. I’m not sure if most people would even consider it a good movie. Maybe there was something in a review about it drawing so heavily from the Hagakure. Whatever my reasons for watching a movie about a mob hitman living as a modern samurai, at some point in the movie it clicked that these principles of loyalty, honor, living as already dead, and more exemplified the Christian way of life in a startling way. 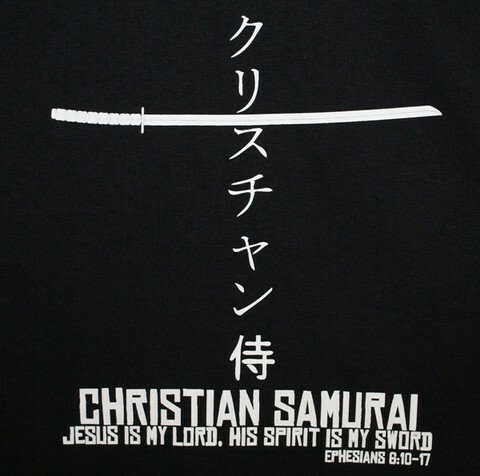 Of course, the Way of Christianity and the way of the samurai are not the same. There are a lot of teachings that were irrelevant or contrary to the Christian life as I poured over the source material. But as I so often explore in my other writings under the concept of Eternal Revolution, Christian spiritual life in the modern world is one of warfare, and we are called to heroic levels of resolve, loyalty, and service. Eventually, the book was finished, and I still get notes and emails about how life-changing the perspective is. Sure, some people miss the point and think I am trying to reconcile two schools of thought. But my point was, and still is this – if a pagan mercenary could serve his fat, greedy lord with complete self-sacrifice, resolve, and loyalty, what can he teach you as a modern Christian claiming to follow a most perfect Lord in Jesus Christ shirk even the simplest of his commands? By the way – if you like the image in this post, it is available here as a t-shirt.